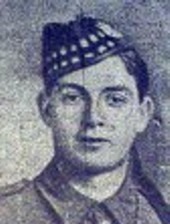 He was unmarried and resided with his widowed mother at 68 West Academy Street, Wishaw, prior to enlisting Joseph was employed at Wishaw Steel Works. 23rd August 1918, aged 32. 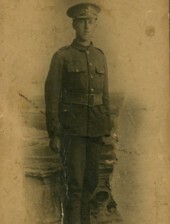 CATER, JAMES PERCIVAL, Private, No 40089, 2nd Battn. The Monmouthshire Regt (T.F.) attfd. 6th (Service) Battn. The South Wales Borderers, s. of John Cater, of Tudorville, Ross, co. Hereford, Fitter, by his wife, Catherine, dau. of the late John Davies; b. Ross aforesaid, 14 July 1885; educ. There; was a Post Office Official; joined the 2nd Battn. The Monmouthshire Regt. 3 June, 1916; served with the Expeditionary Force in France and Flanders from 18 Oct. 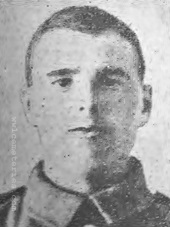 Following, being there attached to the South Wales Borderers, and was killed in action at, near Bapaume, 24 March 1918. Buried at Sapignies. His Coy. Officer wrote; “ I have known your husband ever since he came to us, and he always showed himself a good, clean soldier, and a man who always did his duty cheerfully. We shall all miss him very much”, and his Platoon Officer: “He was loved by everyone, and his manner and behaviour were of the best. 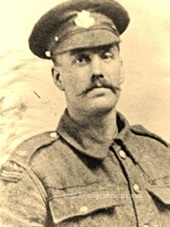 I had the greatest admiration for him, and he was a brave soldier.” He m. At Holy Trinity Church, Drybrook, co. Gloucester, 24 Oct 1908, Mary , (dau. of the late Benjamin Hope, and had a son, James Albert Graham, b. 26 Oct. 1910. 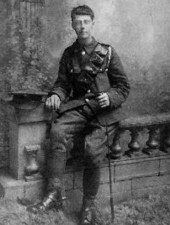 We believe he joined up with the colours of the East Surrey Regiment, August 2nd 1915, aged 16. 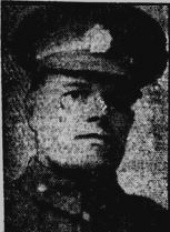 He went to France May 22nd 1917. He came home on leave February 21st 1918, returning to France on March 7th. He was killed at a "place not stated" between 22nd and 26th of March 1918. Doing our best to ascertain his likely place of death, we followed the "Die Hards" areas of battle for those dates and it would appear to have been somewhere around Mory, Arras. Son of Mr & Mrs H. D. Dicker of 52 Castle Bar Park, Ealing, London. Husband of Caroline Dicker, nee White, of 3 Grove Road, Maidenhead, Berkshire. 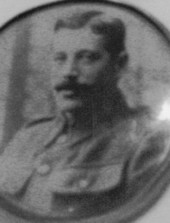 13th May 1917, aged 37. Husband of Annie Eccles, of 2, Rifle Terrace, Walker St., Hull. 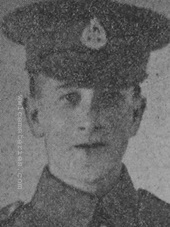 Cpl James Eccles (3/6919) of the East Yorkshire Regiment, who died on the 13th May 1917 in Arras, he was 37 years of age and left a wife Annie Eccles and 7 children. Before the war he worked as a Boiler Cleaner. 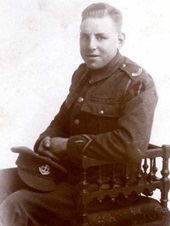 He joined the 7th Battalion of the East Yorkshire Regiment in 1914 and was posted to France, he went missing in 1915 and was reported missing presumed dead. He later turned up in a French Hospital and was shipped back to Hull. 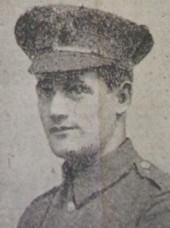 He returned to the front and was killed in Action in 1917. Formerly of the Pembrokeshire Police Force he was wounded on the 23rd March 1918 while leading an ammunition wagon up to the Guns. His wounds were dressed on site and it was believed his injuries where not too serious. His C.O. put forward his award for the M.M. for "his grand and brave work during the heavy fighting round Queant". Unfortunately he died of wounds received and never knew he was to receive the M.M. 28th March 1918, aged 33. Husband of Margaret Emma Fawcett, of 5, Hartley St., Burnley. Miles was the father of two children and prior to enlisting was book-keeper and assistant foreman at Messrs. Hanson's Rosegrove Bottle works, Burnley. Son of Thomas and Margaret Finch, of 5, Little Lane, Longridge, Preston. 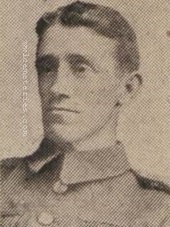 Husband of Mrs Fletcher of 11 Diligent Street, Burnley and a father of one child. Prior to enlisting he was a weaver at Cowpe's Spa Mill, Whittlefield, Burnley. 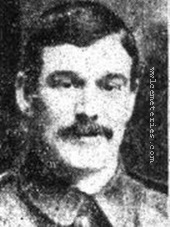 He enlisted on June 6th, 1916 and had been at the front for just 4 months when killed. 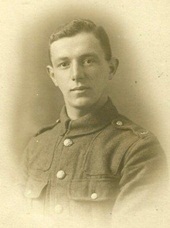 Son of Alfred and Sarah Ann Goodrum, of 21, Aberdeen St., Holderness Rd., Hull, Yorks. "The enemy had got round our flanks and we were forced to evacuate our line to another one a little further back, we were coming back when your son was hit by a machine gun bullet and killed instantly. Owing to the Boshe being close on our heels we were unable to bury him, which we should have done had it been at all possible." 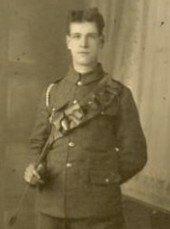 28th April 1917, aged 24. Son of James Crooky Graham and Mary Elizabeth Graham, of 9, Poets Rd., Cheapside, Burnley; husband of Mary Ann Hacking (formerly Graham), of 92, Leeds Rd., Nelson, Lancs. 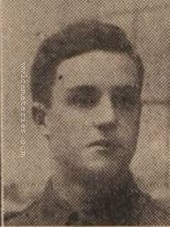 Rennie was married with one child, he enlisted at Burnley on 20th October 1916. Prior to this he worked as a fruit salesman with the Padiham Co-operative Society. He played half-back for the Padiham Lads Football team. 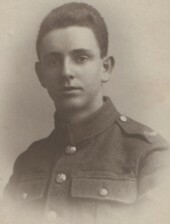 Youngest son of Joseph and Alice Grove of Fleetwood, Lancashire. 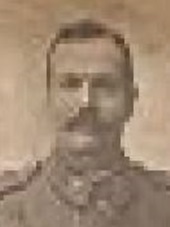 TF/202907 Private Moses Smith Enderby, 4th Bn. 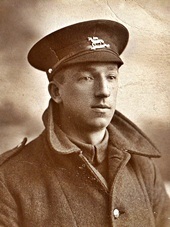 Middlesex Regiment, 23rd April 1917, aged 41. Panel 7 Son of Smith Enderby and Wheldale Veall of Burgh Le Marsh, Lincolnshire. 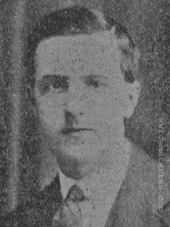 Husband of Ethel Grace Enderby (nee Rogerson) of 27 Stanley Road, Hounslow. Father of Richard, a little boy who sadly died in December 1918, aged 4.